Interesting. Did you try disabling Hyperthreading in the BIOS and running the code with 4 threads? I find that Matlab (R2011a, Ubuntu 64-bit) is a bit quicker on benchmarks with HT disabled. Wondering if that’s true in general of number crunching programs or it’s just a Matlab thing. No I didn’t disable hyperthreading, but I thought about it, as it raises some interesting issues. I’m not surprised by the results you see – I would expect to see the same with my MPI jobs – there is no point wasting time trying to cleverly hyperthread when you have 4 CPU intensive threads – it makes sense that that would slow things down. However, the other potential big difference is the “baseline” speed of one thread. Presumably one thread will run more slowly with hyperthreading disabled, which will then make the multi-threaded jobs look faster relative to 1 thread, even if they are not actually any faster than when hyperthreading is turned on… This is potentially misleading, I think. But the main reason for leaving hyperthreading turned on (other than lazyness) is the same reason I ran stuff alongside a window manager, firefox, etc. – to get some idea about real-world speed-ups, rather than theoretical speedup. Most people are going to want hyperthreading turned on, just as they want to run a window manager, and I am really interested in how much faster my code can run relative to my single process hyperthreaded job… Thanks for your feedback. I see. We have 4 i7s with similar configurations here and initially I had disabled HT on just one. The benchmarks looked a bit better and I didn’t see adverse consequences in everyday use (Matlab, Python, Firefox, NX and so forth), so I disabled HT on all 4 after a few months. Haven’t switched back. I’ve never used the RNGs in the GSL so sorry if this is a stupid question but how have you handled seeding the generator. Is each thread definitely getting its own, independent random number stream? Very nice post. Strangely, there’s hardly any documentation on how to run MPI applications on multithreaded processors, and your post thows proper light on it. A few comments: Since your problem is being strong scaled, it might be well worth running it with a larger problem size, or maybe abandon this altogether and make it weak scale. 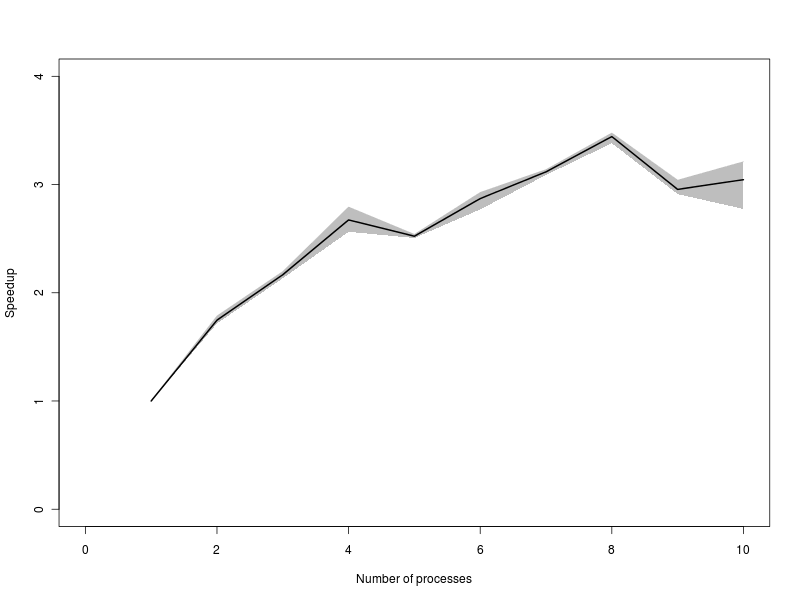 The reason is that since we want to see whether the extra threads in the processor function as extra MPI processes (and we don’t know the details, so we can only guess), we need to ensure that we distribute the load equally across these cores. I would suggest putting in N particles in each core rather than dividing up N amongst 8. I am actually going to take the liberty of lifting your code and running it on my cluster, with N MPI tasks in a hyperthreaded environment, vs N/2+N/2 tasks in non-hyperthreaded nodes. Finally – and no, I speak with the integrity of a man married to science – I can tell you with absolute certainty times appropriate speedup – and which you probably know only too well, that MC codes will be trodden underfoot by GPUs. I am currently working with a monstrously large QMC code, and it’s pretty hard even to get the runs to complete in a reasonable time in their pure MPI+OPenMP avatars. Cheers, and keep the good posts coming! I’ve decided to let your comment through rather than flagging as spam, as it does contain some content. However, I note that your IP address is within the NVIDIA domain, and I consider it very poor form not to declare a competing interest in a comment of this nature. But then that sums up what I think about NVIDIA and their marketing practises. I had no idea that an innocent comment of mine would be taken as a marketing gimmick. Hi Darren: I am actually very curious in knowing what happens if you weak scale this problem by changing 10e9/N to 10e9 in the for loop (so that you will be having a total number of particles that scales with N). If you are working on your laptop, what made you choose MPI over OpenMP? I’m about to start writing a package for R and am trying to decide which to use. Cheers. The main reason is that MPI has the potential to scale up to clusters of workstations – I have used MPI successfully on 16-node Beowulf clusters in the past. If you are really just looking for some speed-up on a single machine, OpenMP is probably fine. ok thanks Darren, I see your point. Have you ever written an extension for R in C that uses MPI? I have written some code in C which I call from R that uses OpenMP because you just compile it like normal C code with the -lomp library, but with MPI you need to use mpirun etc and I’m not sure how this would work with when trying to call it from R. Naturally when I search for R and MPI all I get is the Rmpi package which isn’t what I’m after. Have you tried to do this? The short answer is “no”. 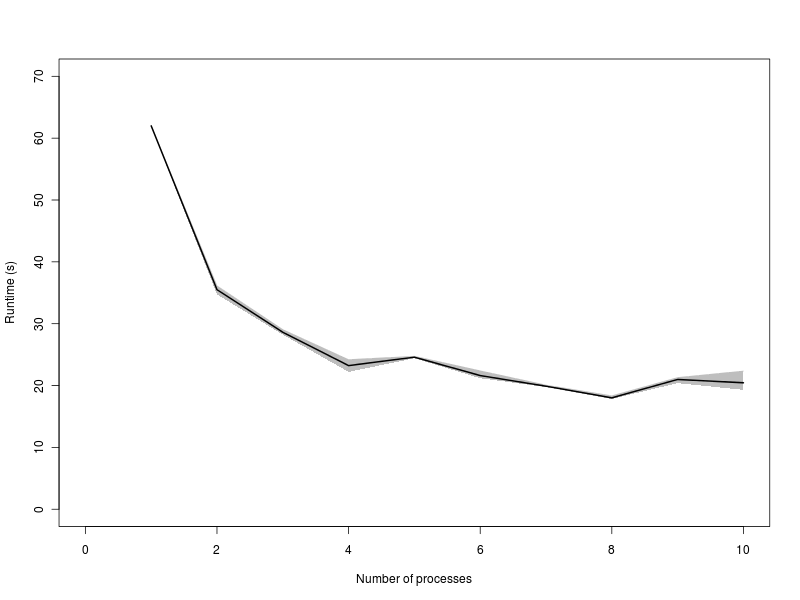 But I’m not really sure it makes sense to want to link a multi-process MPI problem into a running R process. You probably either want a distributed solution, using “snow” or “Rmpi”, or a system call to fire up a bunch of MPI processes using “mpirun”. Alternatively, your OpenMP solution may be exactly what you want! I speak with the integrity of a man married to science – I can tell you with absolute certainty times appropriate speedup – and which you probably know only too well, that MC codes will be trodden underfoot by GPUs. I am currently working with a monstrously large QMC code. I ran your code and optimized for Python…. doing the same calc.